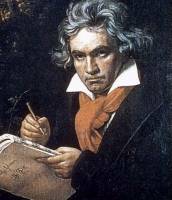 Beethoven wrote just one Opera - "Fidelio" (in German). Just about his only other important bit of Opera is this concert aria "Ah, Perfido" (in Italian), which, as in his other forms, foreshadows the Romantic era of later in the 19th century. "Der Freischütz" of Carl Maria von Weber, could perhaps be considered to be the first important distinctly Romantic Opera. Richard Wagner considered it to be pretty much the only fully German opera that was free of influences from other countries that pre-dated his own work. It is at the core of the current Opera repetoire today in Germany and is done intermitently elsewhere. The Overture and a few arias such as "Leise, leise" are widely performed. R.E.C. Eileen Farrell (February 13, 1920–March 23, 2002) was a famous American opera and concert singer soprano. During her career, Farrell was greatly admired as an opera singer, but she preferred the concert hall and radio to the theater. In the 1955 film Interrupted Melody, which starred Eleanor Parker as Australian soprano Marjorie Lawrence, Farrell's voice was used for the singing parts while Parker lip-synched. Two Wagnerian scenes were climactic moments in the plot. This film, along with the Wesendonck recording featured in Artsconverge, demonstrate how she might have had a top career as Dramatic and Wagnerian Soprano. But she did not conform to the complex biases of Rudolph Bing, GM of the Met. She was every ounce American, which was not an advantage for an Opera singer those days. She is also featured in our Wesendonck album under Art Song - German.